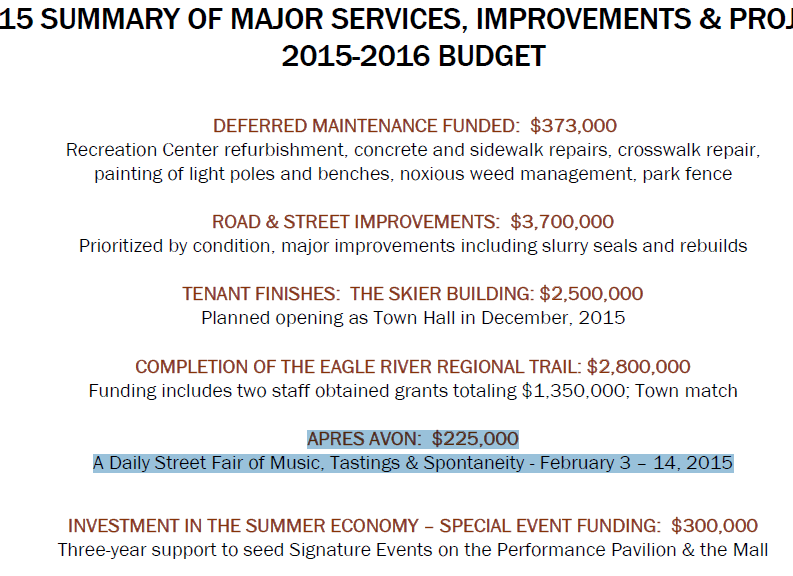 So, using Avon’s 4% Sales Tax figure…the amount of additional/incremental business in the Town of Avon (for those two February 2015 weeks) would have to be – $5,625,000.00 to (break even) for that expense at 4%, RIGHT? Is there any doubt that the Town of Avon got no where near that $5.6 Million dollar figure? Job Creation: Yes, new jobs were created during those two weeks. 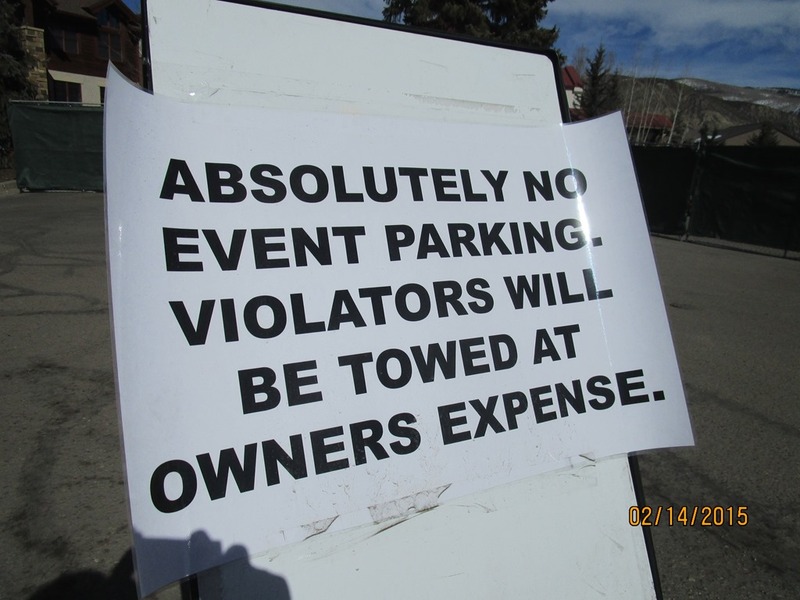 The new jobs created were for Parking Lot Attendants – hired to protect the Commercial Parking lots near the Après in Avon – afternoon events. If you were not a Business owner or customer coming to Park and visit one of the local business – you were summarily – chased away by these new Avon Parking Attendants! Local Signage Businesses: Received a windfall of new Signage orders! It was easy new business for the Signage folks to accommodate, since the message printed on all those news signs – was always the same! 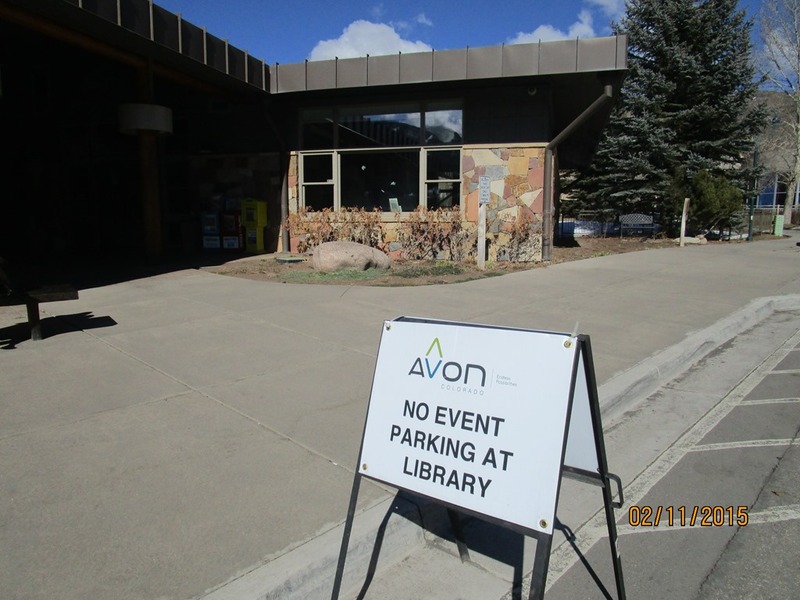 Situated at the west end of Avon’s so called new (pedestrian mall – the Après events epicenter) – is the Avon Public Library – part of the Eagle Valley Library District. 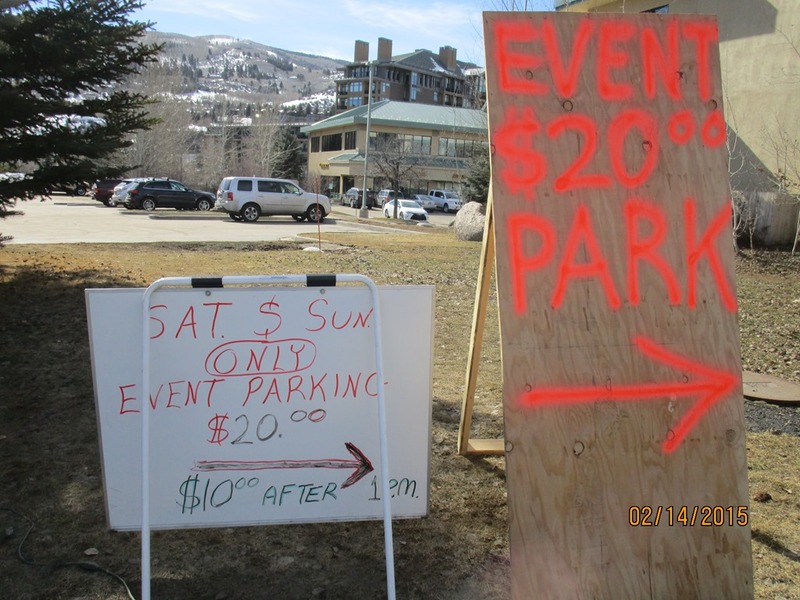 Local Entrepreneurs: Wasted no time setting up their new Event Parking businesses for the two weeks of Après in Avon. Plywood sales at the local Home Depot also saw an uptick. FACT: Did you know the Town of Avon – has trouble complying with their own LAWS? It’s true, the Town of Avon (forgot?) to issue themselves a Town of Avon PERMIT for the AMPLIFIED MUSIC that was played on stage in the afternoon! That’s a fact. Looking Ahead: This Event Parking disaster is only getting started in Avon. Once Avon’s new Music Pavilion (you remember – the Avon Pavilion with the $2 Million Dollar cost overrun) gets started later this year…the disastrous Public Parking problem in Avon – will continue to get worse. « 2015 World Championships – As you’ve never heard them before!